I know that it’s a day late but I only now had time to write – it’s a lovely day in Rome and I am doing a great deal of simple things so now, after lunch I have some time to write before a little siesta. Yesterday, Friday, was a lovely day and I don’t know if it was just me, but everyone seemed happy. The seminarians were off to class in the hot, hot, hot, humid and did I mention weather with big smiles on their faces. The priests were humming little tunes as we walked along, and the ones who teach classes were all fired up. All the good folks at PUSC we as friendly as could be. The tourists we gentle and happy, the streets seemed particularly clean and even the street-folk, the beggars and gypsies were smiling, laughing and talking, letting their children play with one another. My Italian is bad but the poor would talk to me a bit and there is always a little happiness when that is the case. Maybe it was because, though hot it was still a bit cooler than yesterday. Maybe it was because we are preparing for a long weekend. Maybe it was because tourists are leaving the city on Fridays and the city is a bit less hectic. Maybe it was because I went to Confession. Maybe it was because it was the feast of St. Aloysius and I am in my patrons great city. Who knows, but here’s to a good day, gratias tibi Deus! 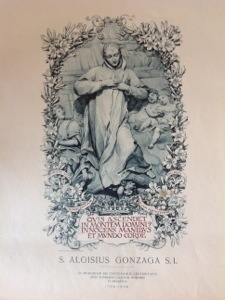 I will contribute much to St. Aloysius, who I was very happily able to visit! 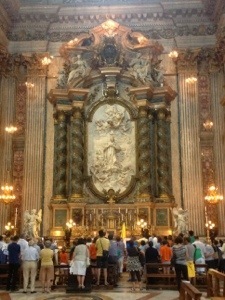 The above picture is of the altar of St. Aloysius in the great church of San Ignazio de Loyola on Rome. The central altarpiece is a beautiful marble relief of St. Aloysius in glory that fills the heart with hope and draws the eye down to the altar, beneath which, in a lapis lazuli sarcophagus, is the body of the saint. And be not mistaken – none of this distracts from the glory of God but only calls, moves and lifts the soul to desire holiness and glorify the one God and Father of all. I prayed for my home parish, my parents and my priesthood. Then I had to leave to be with the men of the Rome Experience. The paper was yellow at the edges and very dry, clearly they hauled these beautiful images out of the basement for this happy day. Why they don’t sell them regularly is beyond my but I this was one more happiness on a happy day! Anyway, the rest of the day was simple, a little work, pray, a wonderful chat at dinner and then off to bed. I won’t deny that I miss my family and my friends immensely, I will be home soon (one week!) and I love you all like Jesus! O felix Roma – O Roma nobilis! This entry was posted in Culture and tagged Catholic, Christian, Church, happiness, Hope, Jesus, relics, Rome, Saints.